The glittering, triumphant Panama-Pacific International Exposition in 1915 was a monumental event. Officially thrown to celebrate the completion of the Panama Canal, the expo was also a chance for a rebuilt San Francisco to display its recovery from the devastating 1906 earthquake, one of Americas worst natural disasters. Constructed over a 635-acre site, the expo showcased a number of marvels: a science museum called the Exploratorium, the Palace of Fine Arts, a five-acre working model of the Panama Canal that took two years to construct, a Ford assembly line that produced a new car every 10 minutes, transcontinental phone calls, and a recreation of the Dayton Flood. The original Sun-Maid Girl even took to the skies in a 10-minute hydroplane flight during which she showered the admiring crowd with raisins. Perhaps the crowning piece was the Tower of Jewels, a 43-story tower that was then the tallest structure in the city. Over 100,000 pieces of crystal and polished glass hung on the tower, shimmering like gems in the sunshine. Because of the towers rainbow hues, the expo grounds came to be called The Jewel City. In all, construction cost over $25 million. Over the nearly 10 months the expo was open, more than 18 million visitors from around the world came to see the fair. They walked down the broad promenades, took in the scientific and educational presentations, traveled to other countries in the international pavilions, and enjoyed exciting displays of racing, sports, art, and music. The cornucopia of sights was so vast that even over several visits, you couldn't see it all. When it was over, the Exposition Company faced the Herculean task of clearing out the site. The company sold every building, piece of equipment, and fixture that it could. Some smaller buildings were transported by boat to new locations. The Tower of Jewels was taken apart and sold piece by piece. Most of the fair buildings were built of plaster and chicken wire and were demolished once they had deteriorated. Today replicas of a few of the buildings, including the Palace of Fine Arts, remain. The expos most lasting physical mementos are available today in a form you can own: commemorative coins. Congress authorized the San Francisco Mint to strike a series of five commemorative coins for the fair: a half dollar, gold dollar, a $2.50 coin (quarter eagle), an octagonal $50, and a round $50. The $2.50 coins were the first commemorative ever created in that denomination. Charles Barber, the U.S. Mints chief engraver, created the $2.50 coins obverse design, featuring Columbia riding a hippocampus across the waters of the canal. Columbia, a female personification of the United States, has appeared in American poetry, paper currency, coinage, and statuary. The $2.50 coins incarnation of Columbia holds a caduceus, a symbol of medicine, to represent medicines success against yellow fever. The U.S. government and Army's eradication of yellow fever in Panama allowed for the completion of the Panama Canal. The hippocampus is a mythological creature with the upper body of a horse and the lower body of a fish. 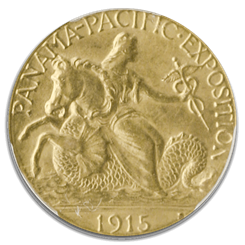 PANAMA-PACIFIC EXPOSITION and 1915 appear on the obverse. George Morgan, designer of the famous Morgan Dollar, created the reverse design: an eagle atop a Greek column. The eagle may refer to the necessity of the Panama Canal remaining open during World War I. UNITED STATES OF AMERICA, E PLURIBUS UNUM, and 2 DOL appear on the reverse. The unsold coins were melted, leaving only 6,749 extant. A Pan-Pac quarter eagle would make an excellent start to a commemorative collection or an addition to one already started. Blanchard is pleased to offer you this coin in Mint State 64 condition with a Certified Acceptance Corporation seal.